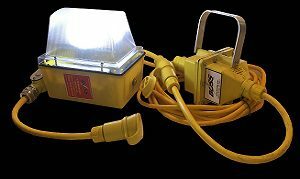 PORTABLE LED WATER-VAPOR PROOF HAND-LAMPS 12-VOLT are the most common used water-vapor proof hand lamps in the confined space entry, tanks and vessel working areas. 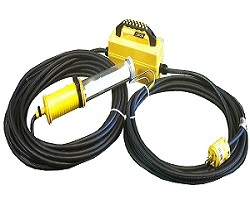 These unit come with low voltage lighting transformers, BOSSLTG MODEL#E31-SHUTTLE. This is a in line transformer taking utility 120v electrical power and reducing it to 12 volts to operate the 12v LED light bulbs. The Vapor proof designation refers only to Water vapor. Not to be reference with Hazardous location classified work areas. 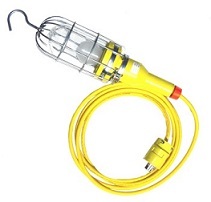 These hand lamp comes standard with a quick opening lamp guard with a hook to hang the hand lamp. 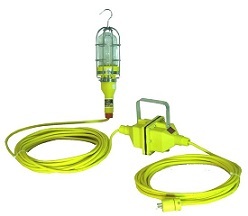 The quick opening guard was designed to make it simple and fast for a operator to change a light bulb in the field. No tools required when taking off the metal guard. The hand lamp must always be hung by its hook. 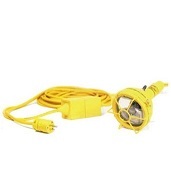 To hang hand lamp by the lamp cord will void the warranty of product. Hanging by cord will allow water to seep down into the wiring compartment of hand lamp.